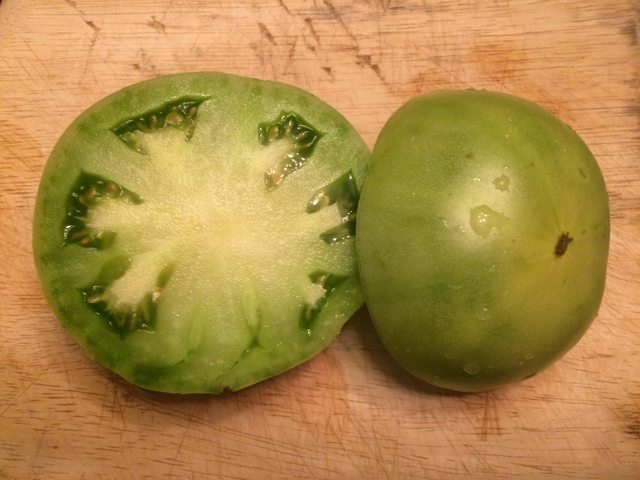 Is your tomato called Green Giant, or is it Dixie Green Giant? I'm growing Dixie Green Giant this year. Have you grown it? Wonder if yours is a different tomato what the difference between the two is. Mine's not ripe yet, I don't think. Not sure how to tell when it done, but it looks so close to yours. There's a Dixie Golden Giant, which are lemon yellow beefsteaks. But I've never heard of Dixie Green Giant. Maybe whoever you got the seeds from just had a brain blip and conflated the two names when they wrote it down and what you have is Green Giant seed? Thanks so much! Glad I asked. Your right. Went back to my trade source and they goofed. It is Dixie Golden Giant. Now to change tags and database. 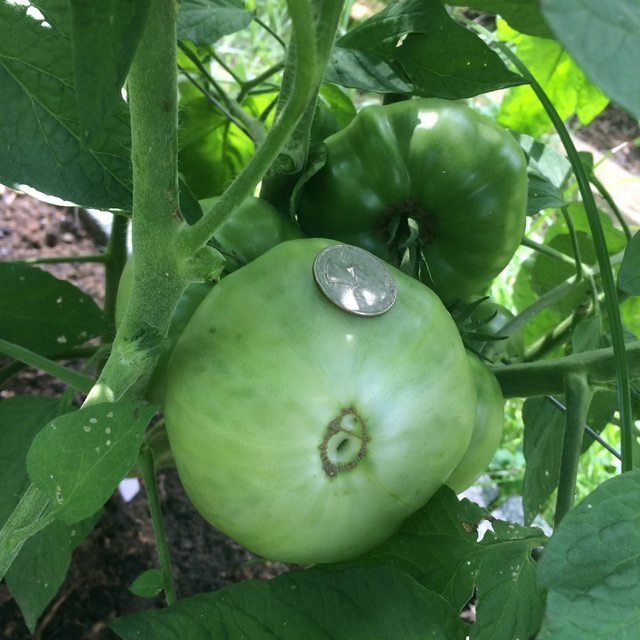 By the way your Green Giant is really a nice looking tomato! Thx! This variety makes a very attractive plant. Just a heads up: Dixie Golden Giant is regular leaf, IIRC. 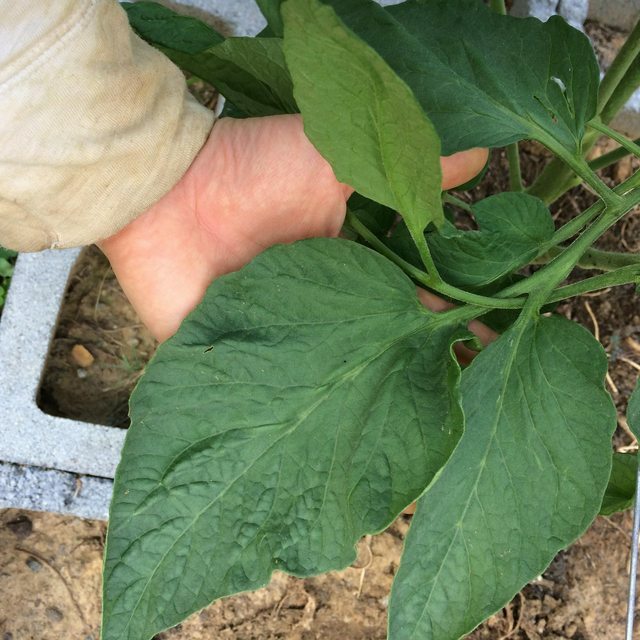 Green Giant, OTOH, has big, striking potato leaf foliage. This leaf isn't even at full size yet (for perspective, I'm a short lady and have small hands, but the leaves are still a good size). 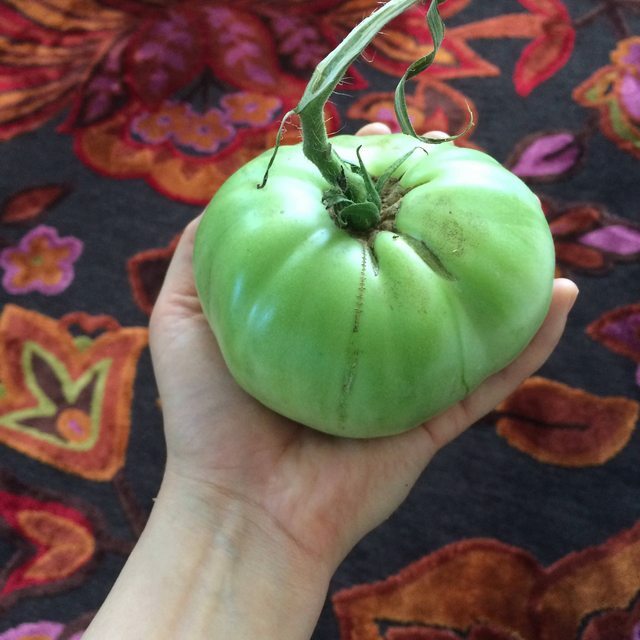 Agree - Green Giant might be the best tasting tomato I've ever grown and the fruit are huge. Challenging thing is determine when they're fully ripe. My goodness!!!!! I'm a foliage person even before I see the tomatoes and I have never seen such huge leaves before. I can see where they getting the name Green Giant even before seeing fruit. Amazing! Just amazing! So far, the fruit on my plant aren't that large. But the first truss has 6 fruit on it, which is a lot for a large-fruited plant, so I suspect the fruit on that truss is going to be a bit smaller than they can potentially yet. I really spoke too soon. Soon after this post, all the fruit on that truss put on a lot of mass. They're really quite large now. Some of those are less rock-hard than they were and are turning whitish toward the blossom end. In any other large GWR variety, I'd wait for a blush to indicate when it's ready, but GG is going to be a bit tougher to call. Green Giant is a definite in the garden next year. Unfortunately I don't have a green this year, my 4 Malachite Box seedlings got pulled during hardening-off with mold. I'm about done with regular leaf, the potato leaf plants seems better for containers and my conditions. Had my first Green Giant yesterday. It was good but not great. I think I ate it a bit early, plus we've just had a lot of rain. It surprised me--it was the smallest in this truss, and hadn't expected this one to ripen first. It has a barely detectable pink blush at the blossom end, and the shoulders were still a bit hard. I think I'll let future fruit ripen a bit longer before judging. The fruit have almost no core and are very meaty in structure. This one fell off as I was pruning this morning. Not tragic, as it's already softening on the blossom end and probably would have been ready to pick in a couple of days anyway. There are three more on that truss that are at about that big. I have just one GWR and that is Aunt Ruby's GG. I love the taste. It is a definite repeat in my garden from now on. I need to do a ARGG vs. Green Giant versus grow at some point. But I don't have room next year. It did look like you picked her a little early. Pulled one off the plant at peak ripeness yesterday. It had blushed a faint dusting of light pink/orange over most of the fruit. So here in my garden, it does change color a bit. 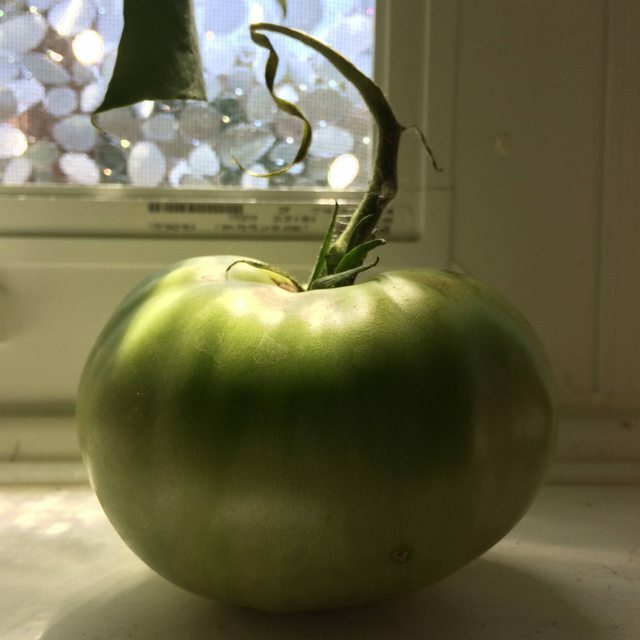 I thought it might be overripe--it had escaped my notice until it blushed, and I assumed I'd let it go too long. It was amazing. Easily one of the best tomatoes I've ever eaten. Next time, I'll try to get a pic of the color change. I was definitely pulling the early ones off too soon. gorbelly, I do pick mine at first sign of blush for fear of cracking. Once it splits, it doesn't take long for it to break down, like a CP. Just try it on anything you can think of. It really brightens up everything. One of my favs for sure...approaching my top 5!